Your Complete Convention and Trade Show Materials Solution Company. Partner with AlphaGraphics Today and Discover High-Quality Trade Show Material Solutions. Whether you need custom printed business cards, show dailies, postcards, brochures, catalogs, flyers, newsletters, sell sheets or branded promotional product ideas, we have the right solutions for your convention and trade show marketing needs. With our nationwide network of business centers, we can help distribute your trade show material quickly and cost-effectively. Ask an AlphaGraphics professional today how targeted direct mail, personalized microsites (PURLs), email marketing and QR codes can help get the word out to your exhibit audience before, during and after your convention or trade show. Complete Trade Show and Convention Signage Solutions. Make your exhibit stand out with our turn-key trade show and convention signage solutions. We offer a wide range of custom size, substrate, hardware, finishing and indoor/outdoor options. 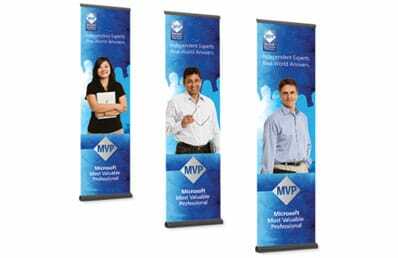 From custom, economy and interchangeable banner stands to high-impact sign, poster and banner printing we have the right solutions to meet your exhibit’s marketing goals. Contact an AlphaGraphics Professional Today to Start Your Trade Show Materials Project. Whether you supply press-ready files or we design it, our experienced layout & design, creative and prepress team will ensure your convention and trade show materials projects are produced cost-effectively and according to your project specifications start to finish. We are a one-stop solution for your design, printing and marketing projects. Get Started Today and Discover Complete Trade Show Materials Solutions.